Inventive and bold, this film shines with pristine picture and theater-quality sound on Blu-ray Disc. In an empire ruled by fear, the people's only hope is the ultimate weapon: Zatoichi (Takeshi Kitano) - a blind, nomadic samurai whose sword has made him a hero and whose courage has made him a legend. 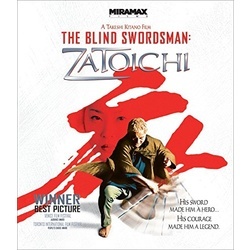 Determined to help the desperate residents of a village, Zatoichi seeks justice through revenge. It's a wildly entertaining film that's even more brilliant in Blu- ray High Definition.